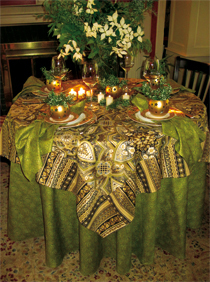 finest and largest selection of table linens. Our placemats, napkins, tablecloths and decorative accessories are made from the most beautiful decorator quality prints. We provide the retailer access to a variety of trends from traditional to "cutting edge". Our 100% cotton and innovative cotton blend fabrics, from the finest mills throughout the world, are sewn in Connecticut, USA. are noted are our label. Check out our new fabrics for 2016 ... go to "our catalog" and see everything beautiful for Fall, Holiday and Spring Preview.